Johannes Deutsch's website documents his many video and media projects. Many of his works are visualisations of music. Beautiful work. 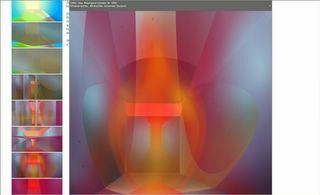 The link presented here links to images of his visualisation of Richard Wagner's Das Rheingold. Das Rheingold - Visionized. "For a concert performance of Rheingold at the Brucknerhaus Linz, Johannes Deutsch and the Ars Electronica Futurelab were commissioned to design an interactive, computercontrolled visualization that will surround the audience seated in that venue�s main concert hall with an 850 m2 black projection screen. Then, concertgoers wearing 3-D glasses will be completely immersed into a three-dimensional manifestation of virtual gods and their spheres." "The computer-controlled scenery follows Wagner�s work and reflects the interpretation of the musicians in the form of dynamic structures that embody the opera�s characters and settings"
"a transdisciplinary team of specialists was given one year�s time to teach a computer system to analyze Wagner�s �Das Rheingold� and to interpret it according to design criteria. The raw material in the form of conceptual designs and formalized intentions is modulated in real time on the basis of musical information." "developing a visual language capable of expressing both the artist�s intention and the team�s interpretation of the Ring"